Something I’m hoping you will gain from this review is how much this series means to me personally. Finding a deeper meaning or understanding in comics makes reading enjoyable. It makes you want to read more, to learn more. Further detail will be provided below, but I will start this longer than normal review with my general thoughts of the series, then I will give more detailed review of issues #11-20 in the Deluxe Edition Book Two. 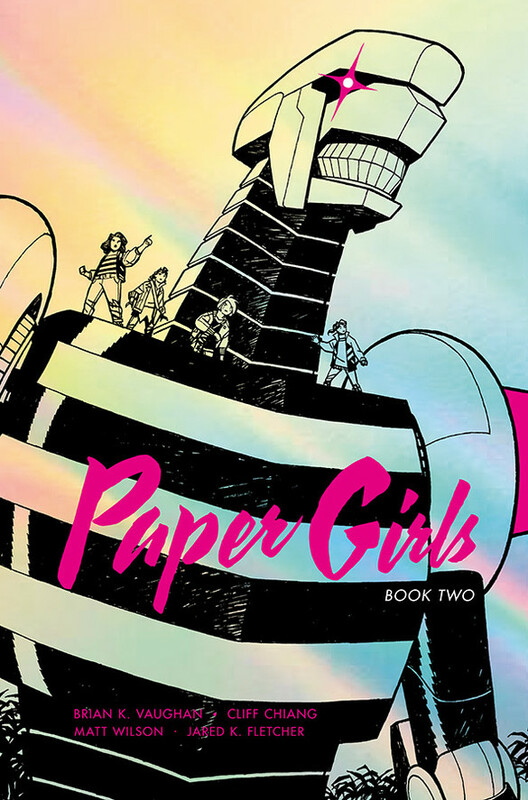 Paper Girls is absolutely one of my favorite series ever. Not just in print right now, but on the whole of the comics I’ve read. Regularly when reading Paper Girls, I am inspired by what Vaughan has written and what Chiang has drawn. The heart that has gone in to the characters of Mac, KJ, Tiffany and Erin is nothing short of amazing. I feel for the girls and I understand them. I smile, I laugh at, and with them, I am afraid when they are afraid, and I am angry and confused when they are as well. But I root for the girls especially, I care for them and I want what they want. Hero’s like these “Paper Girls” can be hard to find. They are regular everyday kids, no powers, no special abilities. What they do have is a strong friendship. One that is tested on a page to page basis, and through time and space. Barely any comic I’ve ever read has made me feel the way I feel when I’m reading Paper Girls. Book Two of the series collects issues #11-20, and we first meet the girls jumped back in time from there jump forward in time from the previous issues. For the first occasion in quite a while, the girls are back together again, for just brief moment. KJ puts it quite wisely they are separated quickly in the “Land of the Lost”. The add on of a couple new characters and with Vaughan’s writing we are immediately concerned about their well being, and their surroundings and the dangers that follow them. New characters, as well as characters we have already seen who look younger or older, make these 10 issues very intriguing. Seeing the girls interacting with there past, present and future is great to see. Brings back memories of so many types of media, Back to the Future or Quantum Leap being some examples. The threat to the girls and their past/present/future is real. Death is on the doorstep many a time for each of the girls. When Erin met her future self for issues #5-10, the story rightly focused on her and what she will become. As well as Mac when she finds out her future fate. We see some serious changes in KJ in these issues, Tiffany and her get the light shone on them, and finding out more about their story is a good switch from the prior. Tiffany gets a rude awakening when she comes in contact with a future for her, that will change who and what she becomes. Being a father of a 10-year-old girl myself, watching these girls go through changes physically and mentally puts me in a state of mind where I care about them. I care about the mindset of the girls, about their feelings. I care because my daughter will change, her future will be whatever she makes it and whatever choices she makes now can effect everything in her life. The major fear of peril comes from the Grand Father (Jahpo? How old is the guy?) and the old-timers. The threat comes to the forefront in issue 16 when the girls make their jump to the year 2000. Its funny now to read the threat of Y2K on the population, and how absurd the whole idea was to begin with. Battling robots like some kind of Pacific Rim crossover adds an extra depth to the story, as well as some new and explosive action beats. Previously hand to hand combat had mostly been employed. KJ being one who will know this all to well at the end of issue 15. Reading this series and watching the girls time jump, you piece together the story as it comes, I try not to think about the logistics of time travel and the space time continuum jargon. But watching younger characters become old in the matter of a page turn or watching as the girl’s future unfolds in front of them no matter how hard they try and get back to 88, all I want to do is read on. This review is of Book Two, but there are new issues being released as I write this. I will pick up the reviewing of the single issues as they come but this felt like a good starting off point. Reading the series with Deluxe Editions (Book One and Book Two) is a really fun way to read, from issue 1 to issue 20, every five issues the girls end up in a new time. #1-5 1988, #6-10 2016 #11-15 11,706 BCE #16-20 2000. This makes every book in the series stand alone in way. Reading the Deluxe Editions let you the reader sew together the threads from the endings of the issues right into the next. The art in between issues really makes you stop and pay attention, quotes and information are also added in for a different effect. I love this series, I love this book. I am biased, I am aware, but also this series is special. If you’re not reading this series you should. The Deluxe Editions are a great way to get started and get you right into the meat of the series. What the creators of this book have accomplished over the first twenty plus issues of this book is nothing short of outstanding. The series is on the home stretch and the final issues upon us. Will the Girls get home? Will home be the same when they get there? Will they as well? I can’t wait to find out.